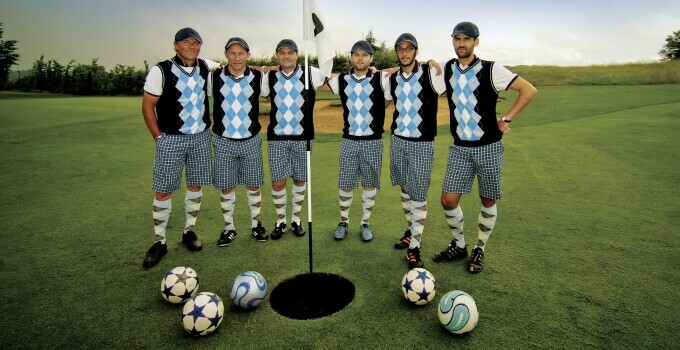 “FootGolf,” a relatively new sport combining golf and soccer, has been gaining momentum over the past year. It may see an even bigger increase in popularity after a Readington Township, N.J. man won the inaugural Spanish FootGolf Open. Mark “Woody” Woodward stumbled upon FootGolf last August when planning to play golf with friends at High Bride Hills G.C. in High Bridge, N.J. When he went to the club’s website for directions, he found out that the club offers FootGolf. “I’ve been obsessed ever since,” says Woodward. FootGolf mimics golf with the use of a tee box, green, hazards, scorecard, and amount of people who can play in each group. The biggest difference is the size of the cups, which are 21 inches in diameter to accommodate the larger soccer ball. The tournament Woodward won consisted of 36 holes with 88 players involved. After finishing in a tie with German player Julien Kelkel, Woodward won in a sudden death playoff to become the champion. It was the first time an American had won a European FIFG tournament. Check out the article on nj.com.